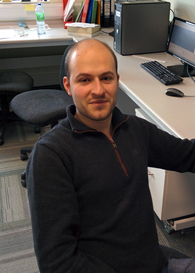 Romain is focusing on the kinetic and dynamic kinetic resolution of various organocatalytic reactions. U. Farid, F. Malmedy, R. Claveau, L. Albers and T. Wirth*, Angew. Chem. Int. Ed. 2013, 52, 7018.